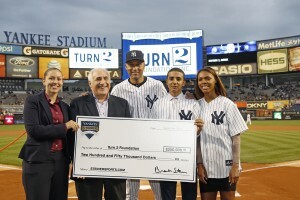 Liz Martin (far left) is the Director of Team Partnerships for Steiner Sports and recently presented Derek Jeter and his Turn 2 Foundation with a $250,000 donation on behalf of Steiner Sports. Liz is responsible for managing all relationships with the various teams that Steiner Sports partners with including the New York Yankees, Madison Square Garden (Knicks & Rangers), and the Brooklyn Nets. "I thoroughly enjoy being immersed in the professional sports world and prefer this type of career over working for a specific team or league because I get a variety of sports and athletes, as opposed to just one," Liz recently explained. Her duties include obtaining game used memorabilia and frequently working directly with athletes in public and private autograph signings and meet and greets.